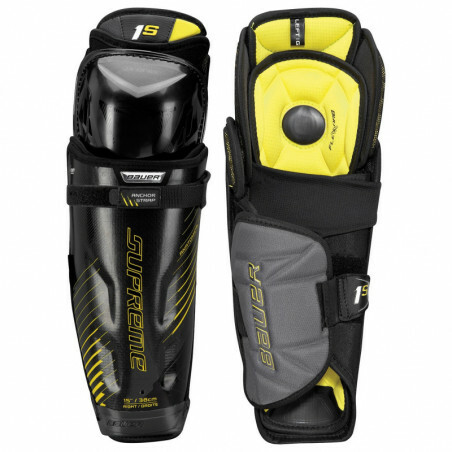 The Bauer 1S Shin pads offer the ultimate in protection at a very minimal weight. The supreme line provides a natural anatomical fit that keeps the protection close to the body to achieve maximum power and protection with every movement. A strap lock system helps enhance the fit of the 1S and better secure the shin to the body for added stability and protection. The 37.5 Technology liner works in hand with the strap system by using the tighter fit to better wick away moisture from your body. The 37.5 liner dries the pad faster as you sweat more using the heat from your body to speed up the moisture wicking reaction. Protection-wise the knee and shin caps are vented to promote better airflow and are molded and ribbed for better puck deflection and a lesser impact felt. Vent armour foam is found on the thigh guard and is molded along with a PE insert into the calf wrap for full protection. At the side of the knee, additional protection keeps your knee joint safe with a molded PE insert and MD foam. Lastly around the interior of the knee, the shins use FleXorb foam which provides the ultimate in energy absorption to add protection and keep your knee locked in place.